Numbers in the above figures are plotted according to geographical data on herbarium specimens, uppermost figure shows stomata rows per band; lowermost figure shows abaxial margin cells without papillae. Numbers in while belong to T. canadensis. The Baccata Alliance in the Euro-Mediterranean usually has 8–10 stomata rows per band (yellow numbers in upper figure) and a marginal a border of 4–7 cells wide (red numbers in lower figure), represented mostly by T. baccata and T. recurvata. The less frequent numbers in red for stomata rows and yellow for marginal cells represent specimens of T. baccata or T. recurvata that show affinity to T. canadensis, T. biternata, and T. contorta. The T. baccata complex mentioned above actually includes four species complexes as described below. The Taxus Baccata Group is divided into two species alliances based on leaf anatomical data: (1) a Euro- Mediterranean T. baccata Alliance, possibly derived from an ancestral T. contorta/wallichiana complex, and (2) an E Asian T. cuspidata Alliance that has affinities to a T. chinensis/umbraculifera complex. These alliances differ in the type of stomata band as defined by its width and density of stomata. Differences in stomata density are seen in the frequency of stomata within and between rows, generally measured by the number of stomata rows in a band relative to the absence of papillae on marginal cells. The Baccata Alliance has fewer stomata in slightly wider bands—at least by 4 cells—in which the stomata bands usually extend to 4 cells from the margins, whereas the Cuspidata Alliance has a higher density of stomata in narrower bands, most often bordered by a marginal zone of 8–18 cells wide. Other subtle differences between stomata bands of these species alliances involve arrangement of accessory cells and their developmental patterns of papillae. In the Baccata Alliance, the accessory cells are often fusiform with papillae usually covering most of the cell. Their arrangement is diamphicyclic (Florin 1931) but with a narrow straight line of cells between stomata rows. A transitional region of fusiform papillose cells extends to a marginal zone of shorter rectangular or trapezoidal cells that lack papillae. Stomata bands in the Cuspidata Alliance, in contrast, usually have ±pentangular to quadrangular or triangular accessory cells with concrescent papillae. Their stomata rows are not separated by a line of cells; rather, stomata often share the same stomata pit. A third type of stomata band in the Baccata Group is found in T. canadensis. Its bands are much narrower (Nicolosi 1982)—at least by 12 cells in from the leaf margin; however, the size of its stomata aperture, and the irregular alignment of stomata in rows across the leaf and within each row are similar to T. baccata (Kvaček 1984). The canadensis type also includes hybrids with the baccata type in Europe and the cuspidata type in E Asia as seen in T. canadensis var. adpressa. These basic types of stomata bands (baccata, canadensis, cuspidata)—as measured by the width of the band relative to the marginal region, 4, 8, and 12 cells in from the margin—are each considered an ancestral type. Hybrids, however, are apparent not only between species of these band types, but also with species of the Sumatrana Group, characterized by leaves having wider marginal borders—generally 16, 24 and 32 cells wide. Variation in other leaf anatomical features such as position and size of papillae on cells, shape of chloroplast, color of chloroplast when dried, and shape and arrangement of parenchyma cells also seem best explained by hybridization. The anatomical features appear independently inherited of gross morphological features such as habit, branching, and phyllotaxy. For example, the radial orientation of leaves in T. caespitosa may have evolved from plants that had a prostrate habit with secund leaves by gradual selection for upright forms. In this hypothetical ancestral type, leaves lack papillae across 8 cells nearest the abaxial margin. A broader marginal zone—up to 22 cells across without papillae—was possibly acquired by hybridization with species of the Sumatrana Group as seen for T. cuspidata, whereas the reduced stature of papillae in T. umbraculifera may have evolved more gradually from introgression with T. chinensis. In the Caucasus Mountains, T. baccata var. glauca, which usually lacks papillae on 4 cells across in European plants, may be found with a wider marginal border of cells as a result of introgression with T. canadensis from which the Cuspidata Alliance may have evolved. Yews of this alliance are characterized by falcate or recurved leaves that overlap or crisscross when branchlets are pressed, and by the abaxial surface of leaves having a transitional zone of papillose epidermal cells between stomata bands and a bare marginal border, usually 4–6 cells wide. One species of Taxus has been generally recognized in the Euro-Mediterranean region, T. baccata; however, leaf anatomical data clearly indicate two, T canadensis and T. baccata, and additional species and varieties are recognized by other morphological features. Taxus canadensis—in North America, Caucasus Mountains, Scandinavia, Estonia, and SW Mediterranean—appears more closely related to T. cuspidata of E Asia than to T. baccata. 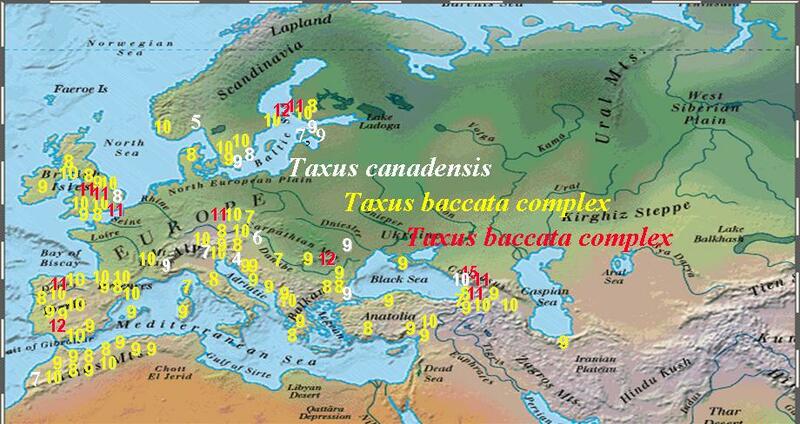 The species alliances of T. baccata and T. cuspidata are most distinct in Europe and E. Asia, respectively, and least distinct in the Caucasus Mountains. Taxus baccata has included numerous varieties or forms (Beissner 1891; Carrière 1855, 1867; Elwes and Henry 1906; Gordon 1858, 1875; Knight 1850; Krüssmann 1985; Lawson et al. 1851; Loudon 1844; den Ouden and Boom 1965; Pilger, 1903, 1916), recognized mostly from horticulture. The more distinct taxa have been treated in Bailey (1923, 1933), Carrière (1855, 1876), Elwes & Henry (1906), Gordon (1858, 1875), and Pilger (1903, 1916). Prior to Beissner (1891) and Pilger (1903), these were often considered varieties; Rehder (in Bailey 1902, 1923, 1933), for example, initially treated them as varieties but later as “garden forms” (Rehder 1940, 1949). As evident in these publications, names for many yews in the horticultural trade were not clearly differentiated (taxonomically) prior to 1855. Those in Carrière (1855); therefore, are given priority in the present treatment except where earlier legitimate names can be applied. Nothing is known about his types or the existence of his herbarium material (Stafleu & Cowan 1976), and I would assume that his knowledge of yew taxonomy was based on descriptive information in literature and study of living material at gardens in France. Authors who have later described more taxa (e.g., Carrière 1867; Gordon 1858) have not always followed priority. And it should be noted that although horticultural material may exist in gardens, valid names cannot be based on living material; preserved specimens are required. Moreover, plants brought into cultivation from the wild must retain the names that were applied to the wild specimens. As shown in this paper, many specimens collected in the wild compare favorably with varieties described during the 19th century, while other varieties described later, as summarized in Chadwick and Keen (1976), Krüssmann (1985), and den Ouden and Boom (1965), appear to be based on minor differences in color and habit that probably resulted from hybridization with existing garden plants. The wide diversity of growth forms that is evident among European yews, along with a wide range of variation in leaf anatomical features, indicate a long evolutionary history of Taxus for which I have suggested that species characteristics were more distinct in the past than at present (Spjut 2007a). This is further evident by comparing yews in geographic areas of greater diversity with those of lesser diversity. For example, in the NW Himalayas where I recognize only T. contorta var. contorta, the abaxial surface of leaves in most specimens have a marginal zone 4–7 cells across, stomata in 5–7 rows per band and a papillose midrib (Spjut 2007a, 2007b). Many taxonomists have recognized yew in this region as distinct from other Himalayan species even though they have not applied the correct name. This is in contrast to yews of Yunnan represented by many controversial taxa that show a wider range in leaf traits—such as stomata ranging from 7–21 rows per band and lacking in papillae on 1–36 cells across the abaxial margin and midrib regions. The relatively narrower range of morphological variation in the NW Himalayan yew—and also for yews of the W Cordillera—may provide a relative time frame as a comparative basis to greater diversity in yew characteristics seen elsewhere. Geological evidence for the uplift of the Himalayas dates back to early Oligocene (Kummel 1970; Hsü 1983)—as also the uplift of the W Cordilleras in North America (Axelrod 1975; Dott & Batten 1976). Although leaves in most specimens of T. baccata and allied species in the Euro-Mediterranean lack papillae across 4–7 cells near the abaxial margin—and possess 8–10 stomata rows per band, the development of midrib papillae is variable as also the habit, branching and phyllotaxy. However, they show a close relationship to the Himalayan T. contorta by the development of resinous (oil) cells in the leaf mesophyll, a feature that characterizes the Baccata Group, in contrast to resin cells produced primarily in the leaf epidermis in species of the Wallichiana Group. Perhaps the Baccata Alliance was present only in northern Asia during the late Paleogene by a species similar to T. contorta. The Tibet Plateau—that possibly had reached 3000 m by the Pleistocene—was occupied by evergreen subtropical to temperate forests dominated by conifers of Pinus yunnanensis, Cedrus deodara, Picea, Larix and Tsuga (Hsü 1983) with hardwood species of Quercus, semecarpifolia, Q,. spathulata, Q. pannosa, Q. monimothicha, Q. gilliana, Acer, Celtis, Viburnum, Betula, Populus, Ulmus, Michelia and Rhododendron. Similar vegetation occurs today in the NW Himalayas with T. contorta as a common constituent (Champion & Seth 1968; Rau 1974). However, earlier fossils—from late Oligocene deposits—in E Europe, which are represented by T. engelhardtii Kvaček (1984), are more similar to extant yews of S China, particularly T. mairei. Taxus engelhardtii occurred in a mixed mesophytic forest (Kvaček 1984; Kvaček & Walther 1998). In the Kwangtung Province of southern China, Chi-wu Wang (1961) reported Taxus in a temperate forest region, found above 700 m, that included species of Fagus (2 spp. ), Castanopsis, Persea, Exbucklandia, Liquidambar, Magnolia, Betula, Alnus, Rhus, and Carpinus (2 spp. ); this report of Taxus corresponds to the occurrence of T. mairei. Wang (1961) also reported Taxus in a "Mixed Mesophytic Forest" in western Hubei that included Metasequoia, Cunninghamia, Castanea, Cornus, Lindera, Meliosma, Acer, Stryrax, Idesia, Populus, Prunus, Kalopanax, Clerodendron, Pterocarya, Quercus, Cercidiphyllum, Betula, Carpinus, Ficus, and Litsea; Taxus specimens from this region also belong to T. mairei. Fossils from later European deposits—Miocene and Pliocene (Kvaček 1984)—resemble T. canadensis, a relatively rare species in Europe that may have been common there during the late Neogene, especially in the northern region. European yew frequently occurs on limestone (Elwes & Henry 1906), a substrate that perhaps yew found refuge during glacial times; it may have once been more common in fen bogs with alder and birch (see Godwin 1975), but now persists in this environment by vegetative reproduction—from adventitious shoots (Loudon 1844) and by layering (yew trees in Norway, Elwes & Henry 1906). As the allegedly more cold hardy T. contorta (replacement species) spread into Europe, it may have come into contact with the coastal yews. Yews have been distinguished genotypically in Germany by their association with inland and coastal habitats (Hertel and Kohlstock 1996). Introgression between the alleged survivors in coastal environments (e.g., T. fastigiata, T. baccata var. ericoides), and T. contorta perhaps led to the species complexes that now exist. In the British Isles, T. recurvata appears intermediate in phyllotaxy between the radial arrangement of T. fastigiata and distichous arrangement of T. baccata, while T. baccata and T. recurvata, appearing nearly constant in their leaf anatomical features, are most similar to T. contorta. The intermediates include two varieties of T. recurvata, a species that is common to chalk downs where “yew woods” form a climax community (Watt 1926; Ratcliffe et al. 1991). Drawings and photos in Loudon (1844), Watt (1926), and Ratcliffe et al. (1991) show the twisted branches that characterize this species (see Fig. 255). Specimens from Ireland are referred to T. fastigiata and T. baccata var. glauca. The latter may have been introduced as yew is generally rare in Ireland, although the Ireland yew is found with a relict species of the Mediterranean flora, Arbutus unedo. Among the few other conifers native to Ireland, Pinus sylvestris Péine is thought to be extinct [Ian Mortimer website]. The natural occurrence of yew in Scotland has also been considered rare (Godwin 1975; Mitchell 1974) where two different varieties of T. fastigiata are recognized, one from Inchcailloch Island (Loch Lomond) and another from near Tweeddale. A large tree—reportedly with a circumference of 16 m, from near Fortingall—is thought to be the oldest living yew in Europe, estimated at 3000 yr (Voliotis 1986) to 6000 yr (http://www.bardwood.com/CELTIC.HTML). In other areas of Europe and N Africa, yew generally occurs in various hardwood and mixed mesophytic forest types, ranging in elevation from sea level to 500 m in its northern range, and to higher altitudes in the southern range—up to 2000 m in S Europe and 2500 m in the Atlas Mountains of N Africa. The hardwood forests may include beech (Fagus orientalis Lipsky) and associated basswood (Tilia spp. ), elm (Ulmus spp. ), oak (Quercus spp.) and ash (Fraxinus spp.). The mixed hardwood-conifer forests are predominantly beech and spruce [Picea abies (L.) Karsten] (Browicz & Zielinski 1982; Duffey 1980) with occasional black pine (Pinus heldreichii; Voliotis 1986). Around the Black Sea, yew may occur in beech-fir-spruce forests [Abies nordmanniana (Stev.) Spach, A. cilicica (Ant. & Kotschy] Carr., Picea orientalis (L.) Link], or spruce may be absent (Browicz & Zielinski 1982). In the Caucasus Mountains, many specimens are similar to either T. baccata in their leaf arrangement, color, and branching, or to T. canadensis by the lack of papillae on the abaxial leaf marginal zone— 8 or more cells wide. Taxus canadensis—a species generally found in low elevation temperate forests—may have spread southwards in E Europe during the late Tertiary (Miocene to Pliocene) as the climate cooled—surviving around the Black Sea where the harsh cold climatic effects of the advancing glaciers would have been moderated by the sea. Later it may have hybridized with T. contorta as that species allegedly retreated south into Europe. Similar histories are evident for other taxa (The Ministry of Nature Protection Yerevan 1999). During warmer interglacial cycles, T. canadensis then may have expanded its range into the Caucasus and Carpathian Mountains, and northwards to the Scandinavian region. A “yew (Taxus) phase north of the Alps,” for example, is recognized to have occurred between 130,000 and 120,000 years ago, a period characterized by mild winters (J. Adams, Web Page 2001). It is interesting that yew is most abundant in Europe in the Carpathian Mountains, and in the Caucasus Mountains where notable occurrences are reported in NW Colchis, E Georgia, and N Armenia (Browicz & Zielinski 1982), represented by both tree and shrub yews (Elias et al. 1992). In selecting neotypes, the available varietal names were considered based on priority of publication, current usage, and information in the original description, but not all varietal and cultivar names are accounted for in this treatment. In some cases, the neotype may not be the specimen that comes closet to the original description, or that which conforms to current usage in modern horticulture. The decision was to make use of as many names as possible rather than to treat each one on an independent priority basis, a compromise to an extremely difficult classification problem to avoid creating new names. Each species or variety itself is taxonomically complex due to apparent hybrids. Their taxonomic features are, however, recognizable in many specimens over a wide geographic range in the Euro-Mediterranean. Although leaf anatomical data of yew show the greatest variation in SE Asia, in the Euro-Mediterranean Region this is exceeded by an impressive range in variation for other morphological features such as habit, color and branch types. Unfortunately, it has not been possible to obtain field data to evaluate these traits with differences in habit, ecology, cone development, and to determine to what extent populations show polymorphisms and introgression because much of the yew habitat has already been destroyed by human activities. 16. Taxus baccata L., Sp. Pl. 1040. 1753; “Foliis approximatis”; “Europa, Canada”; Hort. Cliff. 464. 1738. Lectotype designated by Jonsell & Jarvis (Jarvis et al. 1993); Clifford Herb. 464, Taxus No. 1 (BM! ), undoubtedly from Europe, with mature male cones, leaves densely papillose across abaxial surface, mamillose along margins and on adaxial surface, and stomata in 8–10 rows/band (~60× stereo-magnification). Branchlets often with galls. Leaves mostly in two-ranks, their margins closely parallel along one side of branchlet, or overlapping more than crisscrossing when pressed, secund in part or entirely in some varieties; stomata bands not sharply differentiated; epidermal cells short rectangular to pentagonal near margins, gradually longer near stomata bands, or abruptly fusiform, short rectangular to long fusiform on midrib, elliptical in transverse section, mostly papillose between margins and stomata bands, lacking papillae on (2-) 4–6 (-15) cells across from the margins; stomata bands olivaceous in color in most specimens, stomata in definite rows, (7-) 8–10 (-12) rows/band, diamphicyclic, midrib papillae present or lacking. Mature male cones solitary on branchlets, or many/branchlet in globular aggregates. European yew. Distribution. Euro-Mediterranean. Representative specimens are cited under each of 10 varieties. Taxus baccata is characterized by having equally divided horizontal to pendulous branchlets with ±homomallous leaves (spreading in the same plane along opposite sides of a branchlet, or two-ranked). In other varieties leaves curve upwards on horizontal branchlets. Taxus baccata is one of two Euro-Mediterranean species with leaves having 8–10 rows of stomata bordered by a papillose transitional zone—from 7–21 cells wide and a marginal zone without papillae across 4 (-7) cells. The other species, T. recurvata, differs by heteromallous recurved leaves (crisscrossing more than spreading parallel) that when dried are strongly convex on the dorsal (adaxial) surface with notable color differences between the lower surface—greenish to yellowish and the upper surface—dark green, and by leaves becoming revolute upon drying, especially in the upper third. Taxus baccata often differs from T. recurvata by cones maturing near apex of branchlets, particularly in vars. dovastoniana, glauca, and ericoides, less so in other varieties. It is assumed that such cone-bearing branchlets have terminated their growth, at least for the season. Seed in var. T. baccata var. jacksonii and var. elegantissima may develop on 2nd yr or older branchlets as in T. canadensis. In contrast, cones of T. recurvata often develop on 1st yr branchlets that continue to grow and produce new leaves—the cones often developing from axils of successive leaves from near the base to mid region of branchlets, or from base to apex of branchlets. It should be noted, however, that the type for T. baccata has an abundance of mature male cones near base of young branchlets. Sennen 7087 from Spain at PH is similar by the aggregate of cones and vegetative features, but other specimens with the same collection data are in my opinion not from the same plant; one at BM is identified var. dovastoniana. Many exsicatti with the same assigned number often include different varieties, mounted either on the same sheet, or on different sheets. While most specimens of var. baccata lack cones, they often have the same glaucous foliage as recognized for var. glauca, which differs by the erect secund leaves overlapping slightly on horizontal branchlets. The varieties of T. baccata are classified into four complexes as follows with descriptions of the varieties presented in alphabetical order. 1—Baccata Complex: Branchlets mostly ascending, drooping or horizontal, spreading or dividing at less than 70° angle, reddish orange to purplish; leaves mostly linear, spreading outwards from branchlets along two sides in one plane; males cones in loose aggregates, or solitary. Vars. baccata, washingtonii. 2—Elegantissima Complex: Branchlets wide spreading to recurved, or appearing pendant in one variety, yellowish green to yellowish orange; leaves erect or spreading by bending upwards, not always in the same plane as branchlets, male cones racemose or aggregate or solitary, usually reflexed or pendulous. Vars. elegantissima, variegata, jacksonii. 3—Ericoides Complex: Branchlets mostly ascending to erect, yellowish orange, leaves usually not aligned into one plane but appearing radial, overlapping; male cones in terminal subglobose aggregates. Vars. erecta, ericoides, pyramidalis, subpyramidalis. 4—Glauca Complex: Branchlets variable in orientation, often reddish orange to yellowish orange; leaves overlapping and bending upwards, male cones in loose aggregates, or reflexed and racemose; arillocarpia often in pairs. Vars. dovastoniana, fructu-luteo, glauca.